I never really had or took the time to reflect on all of the life balance benefits that came with being physically active, playing sports, weight training, and competing growing up. As college ended and the real world began, my focus became my profession and building a family. My metabolism slowed down, my diet was neglected, and stress of work and starting a family began to show in different ways. It wasn’t until 2017 that a good friend introduced me to personal training here at Razor. From the very first session I was hooked. I realized I was out of shape and needed to do something about it. I started training with Dan and Kyle. They have pushed me, encouraged me, and have reaffirmed all of the great benefits of living, leading, and working a healthy life. The comradery of partner training has motivated and pushed me to be better and has contributed to building great friendships. Working one-on-one with a trainer has allowed me to reach goals the most efficient ways. Having high blood pressure and cholesterol issues, I want to be healthy to keep up with all of my children. I want to get involved and be able to play and practice sports and activities with them for as long as I possibly can. I want to be someone that will push them to be their best. I hope to instill a healthy lifestyle in them the most; to be the best role model I can for them. I believe that weight, strength, and personal training alleviates the stresses in life, keeps your mind sharp making better decisions, and shows as a sense of accomplishment by setting and achieving goals. Being active and or involved in weight training or sports builds good habits, confidence and discipline. I believe a long healthy life requires discipline and is no accident. I began working with a personal trainer because I was sick of not feeling like an athlete and my wedding dress didn’t fit. I have been a member of Razor Sharp since it started back in 2003 and have always enjoyed working out. There was a period of time where I wasn’t consistently going to Razor Sharp and that was due to the fact that I was a Collegiate athlete. I really enjoyed my time at college and all the running that came with it, but when it was done I was ready for a break. A couple of months passed after college and initially I enjoyed not having to work out every single day. When I went to try on my wedding dress and it didn’t fit, and yes it was too small and not too big, I knew I needed to urgently find a way to get back into exercise. I believe always having a coach for me as an athlete was really important but knew my time in organized sports was over. That was when the idea of Bennett as my trainer/coach came into play. Immediately we started discussing nutrition, exercise, and overall well-being. Bennett was really impressive to me as not only was he aware of what he was talking about in regards to overall health and wellness but was also able to explain the Biology behind it. When I started my training, back in May, I really felt out of shape and by the time we ended our session, which was in December, I truly felt like an athlete again. I learned so much through training with Bennett and on the day of my wedding my dress fit perfectly. Not only did the dress fit but most importantly, I physical and emotionally never felt better and that is all thanks to Bennett! When I first began at Razor Sharp earlier in 2018, I was mostly relying on swimming for my workouts. Although I absolutely loved swimming (and still do), I wanted more exercise variety but didn’t feel confident enough to utilize weights or machines on my own, nor was I making the progress I desired. 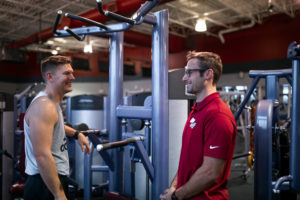 I decided to sign up with Adam for personal training because I wanted to learn how to properly diversify my workout routines and after realizing that I needed extra support in meeting my fitness goals. I’ve been working with Adam weekly for about 8 months and cannot believe the progress I’ve made. Not only have I lost inches, but I’ve also noticed significant improvement in my flexibility, endurance, and strength. I’ve also learned how to properly use weights, resistance bands, and machines. Each session is tailored to my specific needs and Adam does a fantastic job of making sure I have the correct form before intensifying anything. Because I know that I’m learning the proper form, I’m able to continue my training independently on days when I’m not working with him. He has even written down our exercise routines so that I can mimic them when I come to the gym on my own. Our sessions are always different, which makes them interesting and fun. He also motivates and pushes me hard, constantly reminding me of how much of what I can do is actually mental rather than physical. I hear his voice in my head when working out on my own, which pushes me when I need it. Now when I come to the gym, I have a huge variety of exercises to choose from so that each day is different and I’m never bored. Personal training has given me so many tools to work with that I now feel confident in what I’m doing. I’m able to move my body in ways I couldn’t before, I feel stronger, and have noticed huge improvements in my endurance outside of the gym as well. All of this has had a ripple effect and motivated me to make dietary and lifestyle changes, which I’ve been able to adhere to because of how much better I feel. Adding personal training to my fitness repertoire has been absolutely life changing for me. I now rely on our weekly sessions for motivation, guidance, and overall well-being. It’s changed the way I exercise and I know that I could stop at any time and have the skills and knowledge needed to continue on my fitness journey. I have been dealing with lower back issues on and off for years. If I moved the wrong way or tweaked my body just right I would get excruciating pain in my lower back and leg. Every once in a while wasn’t too bad but the frequency was starting to increase. Routine movements would trigger pain and the recovery time was becoming exhausting. I stopped doing the activities I enjoyed for fear of getting hurt. A change was needed. I accompanied my wife on a tour of Razor Sharp. She decided to join and I figured I needed to try something different. I thought maybe I needed more exercise, but I didn’t really know what that meant. So we joined together. Figured some movement was better than none. My solutions for my lower back issues were temporary, and I knew it. I wasn’t getting better but I knew I could. Just didn’t know how. I met with Nate Skop for my KickStart. He was very professional and attentive. I felt like he actually listened to my goals. I decided to start meeting with a trainer. It was time for me to invest in my health. I told Nate I have zero gym/working out experience. He worked with my limitations. We started meeting weekly in March 2018. 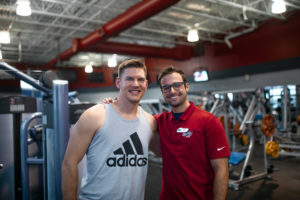 Nate educated me on proper body mechanics, under active muscles, mind-muscle connections, and designed exercises that would reduce my reoccurring back pain. Nate developed a plan to include animal movements, promote core/glute engagement and body weight strength training. Things I could easily replicate on my own. And I do. Every week at Razor Sharp I try to incorporate what I have learned from my sessions with Nate. I still meet weekly with Nate and continue to learn. More importantly, Nate has taught me how to be efficient, with both time and energy in the gym. The results have been phenomenal. I haven’t experienced the lower back pain to the debilitating degree that I have in the past. This has been the longest period in quite a while. I’m not quite 100% yet but real close. Initially, I was happy to be pain-free. Now I’m revisited hobbies I have the strength to do. Lastly, my brief time working with Nate and 2-3 days a week at Razor Sharp has made me feel so much better as a person. I can feel the progress. and, overcome my fear of walking without a walker. I have been a member of Razor Sharp for about 10 years and I typically workout three times a week. During the winter months I also swim laps on the weekends. I have MS (Multiple Sclerosis) and exercising really helps me with stretching and strengthening. When I am in the pool, I can walk without any assistance and this helps me with my balance. In January 2018, I began training with Justin Leach once a week. We continue to work together each week and he pushes me to try exercises that I never thought I could do. We are now working on pushing my walker away from me and I am taking some steps toward the walker. I am really starting to gain more confidence with his help! I walk three laps around the track and walk backwards along one side of the building. My goal is to walk the track without my walker! Working with Justin given me a new found confidence because he motivates me to try things outside of my comfort zone, where I have found great success. My sister, Pam Alley, also worked with a personal trainer (Adam Knueppell) to help her prepare for climbing Quandary Peak with her son. She and her son completed the climb in 2017. Our family has greatly benefited from the personal training programs here at Razor Sharp and I would recommend Adam and Justin to anyone! They are both very talented and help you towards goals you want to achieve. Thank you to the Razor Sharp team! I needed to build my strength for surgery no matter what it took! I have always been very comfortable at Razor Sharp. It is a great place to work out with diverse activities and a friendly group of people of all ages. I have been going there since they first opened and I have to admit, many months I slacked off and procrastinated about exercising. I knew I needed a trainer. I already knew my goals, so I watched different trainers to see qualities that would match my needs. 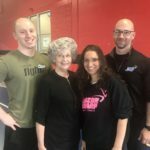 That someone needed to be smart, honest and caring—hence why I chose to train with Lauren Gedemer! At the Kickstart meeting, I was very honest with Lauren about my goals and she was not fazed at the difficulty of those goals. She didn’t even cringe when I told her my situation. I told her that I had colon cancer along with other barriers (such as my two knee replacements) and that I wanted to be as fit as I could for surgery in four months. I didn’t care what it took, I wanted to get rid of those “parasites” within me and I needed all the ammunition that I could get. I knew I could win this battle, but I needed more control over the situation. The more fit I was, the better the results. She saw no reason why I couldn’t do it. She went into “Lauren-mode” and laid out my plan. We worked out for four months and in March 2018, I had an eight-hour surgery (this included colon resection and a HIPEC wash). After surgery it was a two-week recovery in the hospital with God by my side every step of the way. Immediately after surgery, the nurses were impressed that I could do so much for myself and my legs were strong. In my final meeting with my surgeon, I told him I wasn’t sure how to thank him for saving my life. He said it was not only him but also my determination to get in shape and that I should “keep that trainer, she’s worth every penny”. I always joke with Lauren that she is tough on me, but I need it. I need someone to tell me when I exercise incorrectly or slack off on how many reps I am doing. She kept my whining to a minimum and never let me say I couldn’t do it. She listened to me. The best part was that she knew what exercises I needed for my pre-surgery prep work and was very patient, yet strong in getting me to recover after surgery. This workout is the reason I am back to doing everything I was doing before, and I feel great. I’ve lost forty pounds in the process and life is “easier.” I am grateful to be here and for the assistance I have received. I still have more work to do, but I know I can do it!! Stronger now than ever before! I can still remember when I first started weight training at age 15 and the pump that I would get after each and every workout. Somehow, the pursuit of that pump and becoming stronger each day became the norm for me and the rest, as they say, was history (or at least I thought it was). Now, fast forwarding to the age of 45, I can still say that I enjoy hitting the gym, but I am no longer that teenager that can throw around weights like they were nothing. Now comes the realization that my knees, shoulders, elbows, and core need to be taken into great consideration as I could very easily be susceptible to injuries that could derail my progress. Enter Razor Sharp trainer Nate Skop. 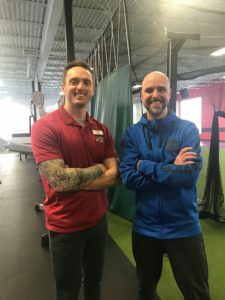 A good friend and exceptional trainer who comes from the same powerlifting/bodybuilding background as I did, Nate knew precisely what I needed to do in order to take my training to the next level while also developing various weak points. It is called functional training. As defined, functional training “attempts to adapt or develop exercises which allow individuals to perform the activities of daily life more easily and without injuries”. 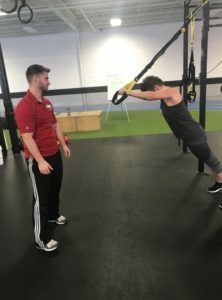 Simply put, functional training incorporates weights, crossfit exercises, and cardio conditioning that focuses not just on personal physical development, but also on the body as a whole and reducing weak areas significantly. Over the last four months or so, I have increased my strength, cardiovascular health, core development, and endurance while also decreasing my body fat significantly. I can actually feel the improvements that Nate has assisted me with. His workouts continue to challenge me while also serving as a reminder that you are only as “fit” as the very workouts you put yourself through each and every week. I continue to maintain a solid foundation of muscle, but am happy to know that I have done so without compromising my new level of fitness. I encourage everyone at Razor Sharp to schedule a time to talk with Nate about their fitness goals and nutrition. Since my conversation with him, my motivation is at an all-time high, and I’m always excited to see how I am improving week in and week out. I gained confidence and even became eager to work harder! 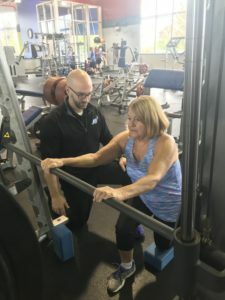 Following my left knee replacement operation, less than one year ago, I decided it might be beneficial to have a personal trainer prior to undergoing the same surgery on the right knee. Although the recovery of my left knee went well, I wanted to strengthen the muscles around my right knee in anticipation of a quicker and easier recovery. As I have gotten older, I also want to work on my personal fitness and stamina because who doesn’t like the benefits of working out—more energy, better sleep, increased strength, etc. etc. and more. 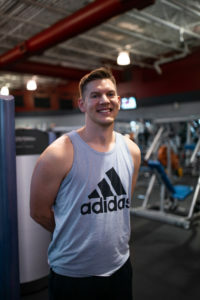 Because I’m unfamiliar with the gym machines, and admittedly a little intimidated, I asked Kyle Knobloch, a trainer I saw on the floor how to do a specific exercise I had seen done on a Facebook post I had seen. After showing me how to do it, he suggested I use my free personal training session (Kick Start Program) I had left unused for the longest time. 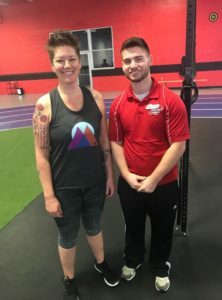 Janelle Cairo, Fitness Services Coordinator, introduced me to Justin Leach, a trainer that specializes in Functional Training and Rehabilitation following injuries and surgeries. 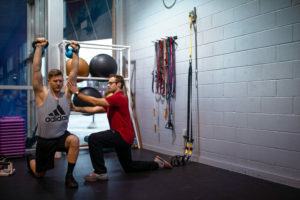 After determining what my goals were at the time—rehabilitation and overall fitness with particular attention to my knees—after just two sessions with him, I became aware of areas I needed to work on. He provided me with new exercises I could practice at home on my own time to better my balance, flexibility and mobility. More importantly, Justin emphasized the importance of exercising with proper technique while exercising at Razor Sharp, because there’s no benefit if done incorrectly. All was going well, and I felt very optimistic about my upcoming knee surgery. Unfortunately, as we all know, things do not always go as planned. While surgery went well, I woke up with a new challenge—foot drop! During the surgery, my peroneal nerve was damaged, and as such, prevented me from lifting my foot up (dorsiflexion). I was devastated (truly), and even somewhat dreaded returning to Razor Sharp after my rehab stay at Ridgewood Care Center. In addition to these emotions, I was immensely disappointed that my best efforts let me down. With Justin, I had worked hard to strengthen all the muscles in my legs to ensure a favorable, speedy recovery. And now, what the heck, I was left with an abnormal gait due to foot drop and my accompanying inability to lift my foot while walking. Despite this new obstacle, I shared my progress and new diagnosis with Justin. While he admitted that he had worked with clients that had existing or newly developed foot drop, he was prepared to incorporate techniques, exercises, and added therapies—like electrical nerve stimulation—as a way to get back to my baseline, functional self. It was around this time that I saw a light at the end of the tunnel. 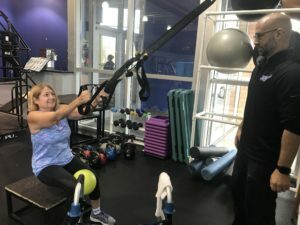 Although it can take up to a year to get back to my previous level of activity, with no nerve pain, working with Justin and his exercise program makes that year feel shorter and just around the corner. Thank you Justin. 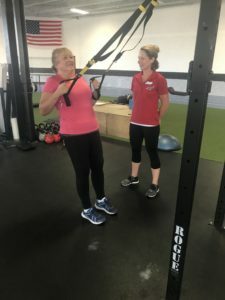 Together with my personal trainer, I gained confidence and even became eager to work harder as noticeable and palpable improvements were seen and felt. It has been very slow at times, and yes, I worried many nights wondering if all this hard work is going to be worth it. Now, five months after surgery, I can confidently say that my sensation and capabilities in my affected foot are improving. It’s slow and only perceptible to Justin, myself, and my physical therapist, David Van DeWater DPT at Advance Spine & Sport Rehabilitation. 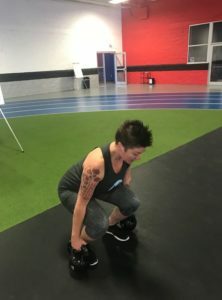 Having and working with a personal trainer at Razor Sharp, I feel better than I did before the surgery, even better than I did ten years ago when I had two good knees and attended Silver Sneakers three times a week. For those of you who have left their Kick Start Program free training session unused, don’t be afraid, make an appointment and see what a Personal Trainer can do for you. It’s an ultimate life changing investment in your wellbeing. With my personal trainer, I now enjoy working out. Joining Razor Sharp Has Been A Wonderful Experience! In May of 2017 I sustained a fracture to my left foot. 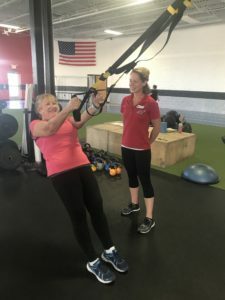 After a long four-month recovery with limited mobility and the need to wear a walking boot I added unwanted pounds to a body that I was already unhappy with. In October of 2017 I decided to join Razor Sharp. I met with Nate Skop for my Kickstart appointment shortly after joining. 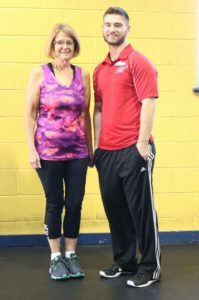 Nate is an extremely knowledgeable personal trainer and had a lot of great information to share. Due to an ever-changing work schedule and having to take call, personal training sessions did not fit well into my daily routine, but I do try to incorporate everything he has taught me into my workouts and his input has served me well. On the day of my Kickstart appointment I also had the pleasure of meeting Janelle Cairo. Since October I have crossed paths with her several times at the gym. Janelle always takes the time to stop, ask about my progress and encourage and motivate me to keep working towards my goal. I have been working out at least 4 times a week since joining, (with a combination of cardio, classes and strength training), and am happy to report that I have lost almost 40 pounds! When people ask me “How are you doing it?”, my answer is always the same — “I joined Razor Sharp.” Obviously making other lifestyle changes has also been a factor but joining Razor Sharp has had an extremely positive impact on both my physical and emotional well being. Joining Razor Sharp has been a wonderful experience so far, and I plan to continue this journey to meet my weight loss goal. If a 51-year-old working mother of two can do this, anyone can! 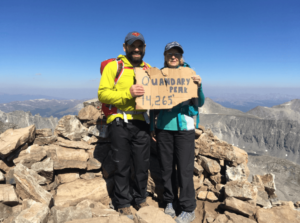 I Couldn’t Have Climbed Quandary Peak Without Adam’s Help! I have been a member of Razor Sharp for about 9 years and have been working out three times a week. Last November my son climbed a mountain in Colorado and was so impressed that he asked me to go with him the next time. He recommended I get a personal trainer thinking I would need new skills to get to the top of the mountain. Adam Knueppel was the personal trainer assigned to me and he helped me in so many ways that I still do the things he taught me. I couldn’t have climbed this mountain without his guidance. I went on this trip with my son on August 25th. We climbed two mountains, the tallest being Quandary Peak at 14,265 foot elevation. It was steep and very rocky so you had to be careful where to put your feet. I know the box steps that Adam had me do really helped and I also did some stairs outside that were uneven which helped. We set foot on the trail at 4:15 a.m. and we got down at 5:08 p.m. We spent 45 minutes on the summit and the rest hiking. Needless to say, I was very tired by the end of the day, but also so amazed at myself, that at 66 years old I could do this!! When we reached the summit I looked around and told my son, Jeff I was the oldest one up there!! I know I couldn’t have done this without my son, he was my biggest cheerleader that day, and then other people heard him and they too cheered me on. This is just proof that you can do anything you want if you put your mind to it. Once again I want to thank Adam, he pushed me and I needed that, but he is so caring and he too wanted me to succeed, and thanks to him I did!! I do want to give a shout out to my son, Jeff, I would never have been able to do this climb without him in my corner. he realized he was losing strength. I suggested he join me at Razor and encouraged him to work with a trainer since he knew little about strength training. 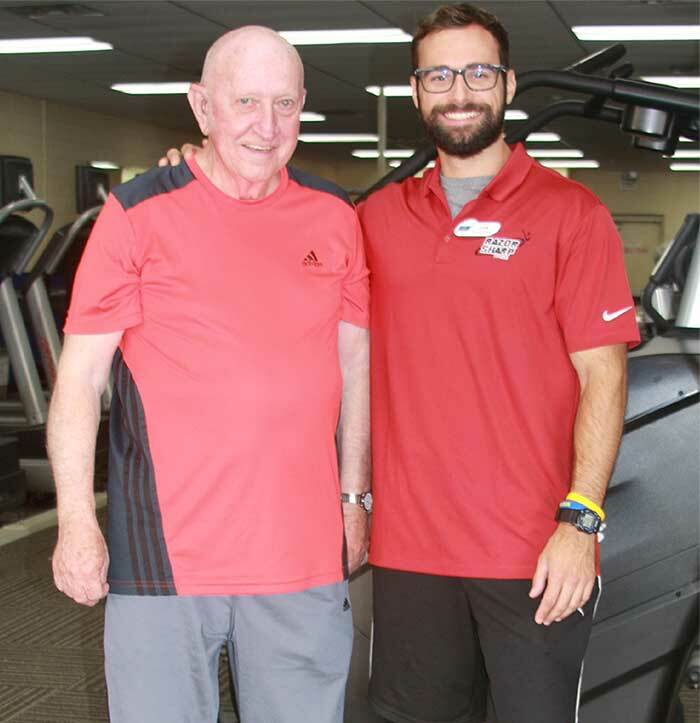 So, twice a week, he works out with Dan: I was so proud of him to take on a completely new challenge at age 74. 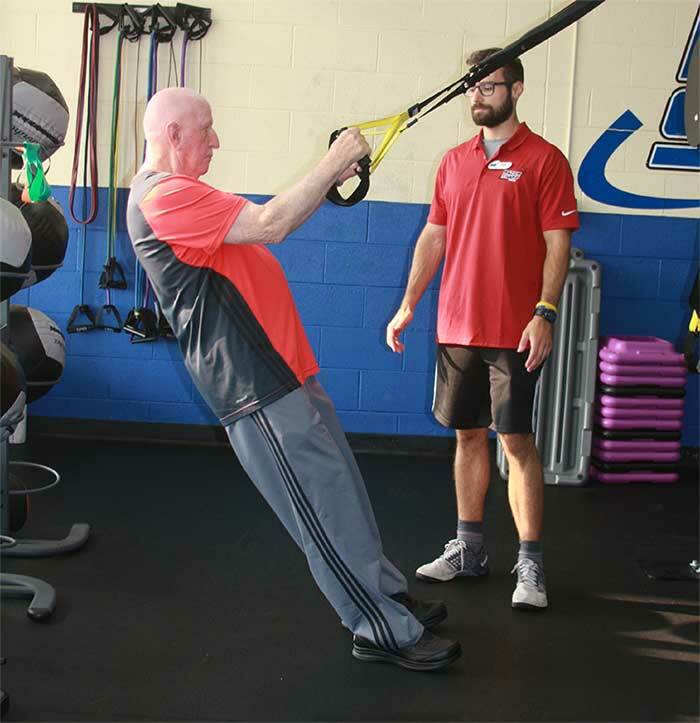 Dan has been wonderful with him, and has done so much to improve my dad’s balance, flexibility and strength. Dad really enjoys working with Dan and appreciates the benefits he gets from his sessions. Jon Carbonneau and Personal Trainer Dan Buhler. John’s Perspective . . . I have really benefited a lot from the personal training. I walk better and I am much more stable. 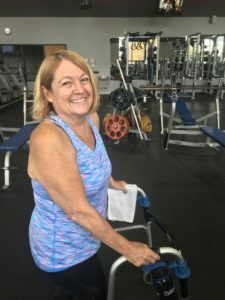 Working out and training has also helped alleviate some of the ongoing issues and pain I have had as a result of a severe fall I had back in the ‘70s. Before I started training, I couldn’t lay down because of the pain I was in; I slept in a sitting position. Now I sleep 100% better, and I can get down on the ground and get back up again. Training makes it easier for me to do everyday activities. If I didn’t have a trainer, I wouldn’t be coming to Razor Sharp. I need the guidance and the structure. Dan really listens to my concerns and adjusts our workouts to meet my needs. I also really enjoy working out with my daughter and spending time together on Sundays. Jessica is 28 years old, a single mother of two young girls, and both works and goes to school full time. On top of all that, she has a dog and a house…so, a lot on her plate! During my KickStart with Jessica, I learned that she’s never really exercised before, drank a ton of soda all day long and ‘hated’ water. We had a great conversation during our time together, mainly focusing on how she needs to be happy and healthy in her own life so that she can be a good, long-living, healthy role model for her daughters. We did a few exercises together and it was apparent to me that her body was used to sitting at a desk and not moving much. 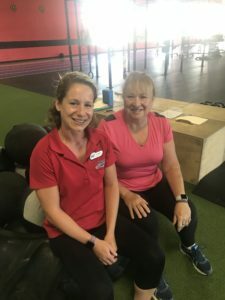 Jessica purchased twelve 30-minute personal training sessions me with me after our KickStart, so I knew she was serious about making a change for the better in her health. Let’s be honest – with all of her responsibilities, it was amazing to me that she could make that type of commitment! But, do that, she did! Jessica and I meet once per week, and in addition to that she also attends regular GroupPower and GroupActive classes, does our workouts on her own time, logs all of her food and is up to over a half-gallon of water every single day! She went from absolutely NO activity outside of regular day-to-day life, to committing wholeheartedly to a healthier lifestyle. Since early-April, she’s cut out soda completely, become 1,000% more active, upped her water intake (she hated it though, remember?? ), started eating healthier and logging everything she puts in her mouth – and her measurements show it! She’s lost more than 14lbs and 2% body fat just since April! Recently, we met after not having a session together for two weeks. Jessica was feeling down because her weight went up 2lbs from our last weigh-in. She hadn’t been to the gym in a week. She was stressed out at work. Her girls’ soccer had been taking up 3+days/nights every week. Her school workload had increased. We had a very real conversation about this – LIFE HAPPENS! We talked it all through and right away she was back on track, telling me she doesn’t want to let me down but even more, doesn’t want to let herself or her girls down. At only 28, Jessica amazes and inspires me with her dedication to making healthy changes in her life. 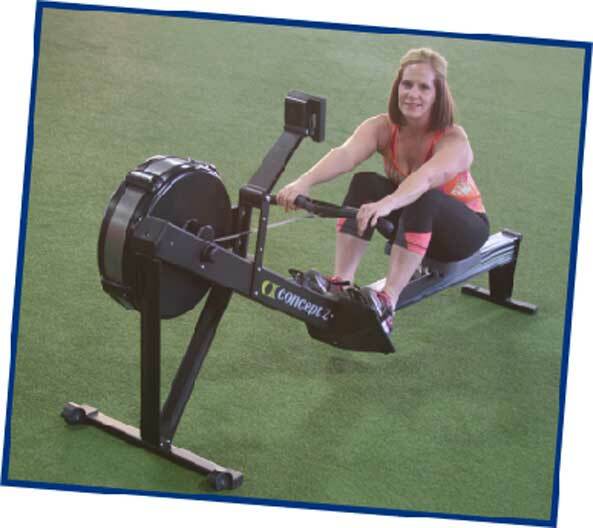 Top Fundraiser, Health Club Division (13 clubs) with $3,171.01 — which was also 23rd place overall! But, those numbers don’t tell anywhere close to the whole story. When team captain Cynde Summers reached the top of the 1,034 steps of the U.S. Bank Center in Milwaukee on March 18, she wasn’t just leading a team of family, friends and Razor Sharp members and trainers — she was carrying the memory of her late mother, “World’s Best Mom, Rose Mary O’Donnell DeMeulenaere” up the 40-odd stories with her. My mom struggled to quit smoking most of her adult life. At age 60, she was finally able to quit for good, but contended with COPD/emphysema and her breathing daily. 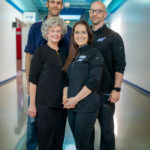 She learned to manage oxygen tanks and even started a support group, the Better Breathers to help others bear the burden of living with a debilitating respiratory disease. She fought a hard fight, but ultimately succumbed to lung cancer at age 73. Her entire life she had a passion for serving others and lived by the motto, “Faith, Family, Friends.” This motto is emblazoned on our team shirt on a shamrock to represent her Irish roots along with the Celtic cross in green on the back. I hope that my mom’s story inspires people struggling to quit smoking to keep trying. 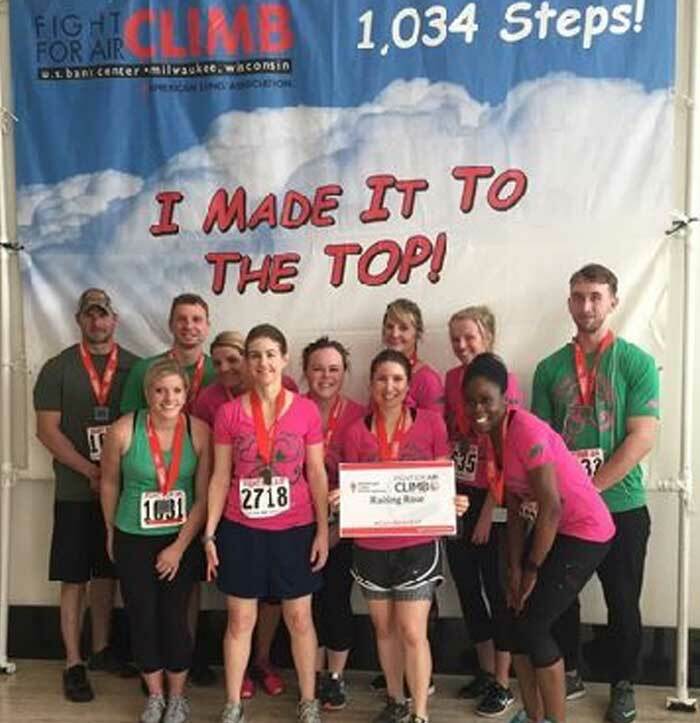 The Climb has certainly helped me to…honor my mother’s legacy of helping others. I began working in Racine in 2004, commuting 150 miles a day round-trip. I have always struggled with my weight and with asthma, and those three hours a day in a car didn’t help. It took several years to finally move to the Racine area. But when I did, my first priority was to join a gym. 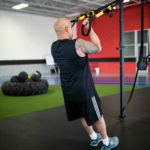 What I was looking for in a health club was simple: a variety of weight and/or aerobic classes, knowledgeable trainers and a mostly adult atmosphere. A friend recommended Razor Sharp, which hit all of those requirements, and I’ve been a member ever since. Although I am a self-motivator, I tend to let my career get in the way of my fitness goals. What I love most about Razor is the ever-changing variety of classes and events being offered; it gives me a reason to tear myself away from my desk at night. My favorite classes and events have been the weight loss challenges, CrossFit, the boot camps, boxing, Tabata, and most recently, Cardio Fusion. I have worked with so many of the trainers, either in group settings or one-on-one, and I would say Razor has some of the best. As I mature, my fitness goals continue to evolve. I wish I was doing 20 years ago what I am doing today. My biggest accomplishment, and the one I am most proud of since joining Razor, has been “re-learning” to swim. Although I took swim lessons as a child, I never again swam in a pool, much less a lake. But, two years ago, I decided to participate in the Iron Girl, and Justin Leach offered to give me a few tips to prepare for it. I then took some private lessons with Kelli Steenrod, who continued to help build my skills and my self-confidence. Race day came, and although I was scared to death, I swam across the entire lake without stopping. One would think I would have been proud of this accomplishment, but no, I was disappointed because I swam the entire race using the back stroke rather than a front stroke. I also zig-zagged so much that I probably swam double the length of the other swimmers! So, I’ve kept working at it. Since then, I have swum across Lake Andrea several times and trained for a Half-Iron Man. Am I proud?? You bet! But, I know I can push myself to work even harder, and my biggest competitor will always be myself! 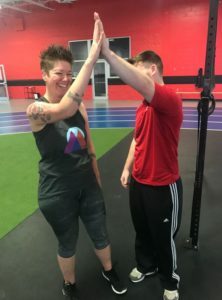 ​As a couple, we fall into a category where I would say the vast majority of people fall: not completely motivated to stay committed to a consistent workout schedule that brings about the necessary results to stay in a fit, physical condition. In the past, we would get into a groove of doing some type of workout for a short spell until, eventually, some event in our lives would disrupt that consistency. And then, the law of inertia kicks in – an object that is not in motion is tough to get moving again. Partner training has been so beneficial for us as a couple. We have accountability to our trainer, but also to each other. It has pulled out our competitive spirit and been a great boost for our marriage. When you think about physical training, you tend to think it only affects your body. But there is an emotional bond that has happened between myself and Dana through our training sessions. Knowing your spouse is committed to improving his or her overall physical condition helps build trust in the relationship. The special connection that teammates or soldiers form through shared physical effort holds true in partner training, too. And, of course, there are the fitness results – I have lost twelve pounds since we started working out in September and Dana has maintained her weight. We both have increased our muscle mass and seen a decrease in body fat. 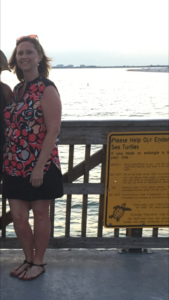 Dana’s body composition has firmed up and her posture has improved significantly. He brings years of experience to the table. We don’t have the time to study every little nuance of the body or what action brings about the greatest change to add strength and correct areas of weakness. 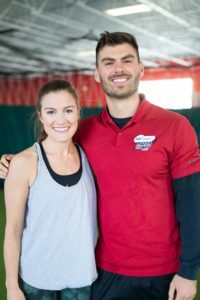 Fortunately for us, Nate has that extensive educational background in how the body works and what exercises are best to increase functional strength. Nate is a great listening ear. We aren’t speaking to a brick wall. I will mention something off-hand during a workout, and he will bring it up a week later when we are performing an exercise that is specifically relevant to my comment or concern. He considers our best interest when choosing workouts for us as a couple. 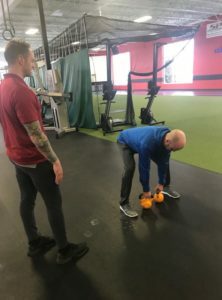 It would be easy to package a cookie-cutter workout for all of his clients, but I know he puts thought into each group that he trains and tailors his training to their unique needs. We look forward to seeing and spending time with Nate each week. What we pay for a personal trainer is an investment in our lives, and it has been one of the greatest investments we have ever made! Most of us just don’t know enough about how to make our bodies work better. We put up with physical limitations, thinking that it will always be that way. But that isn’t true and I’m proof. After a diagnosis of a chronic back condition, I was told that I would probably have constant pain and be limited in my physical activities. On the advice of a physical therapist, I started attending Pilates classes at Razor Sharp. Up until then, I had used weights and the weight machines, but I had not intentionally developed my core muscles. The core muscles are the ones we rely on every day to sit, stand, walk and do almost anything. Pilates has strengthened my core muscles to the point that I do not have any pain nor do I take any pain medication. It’s easy to forget I even have a back condition. 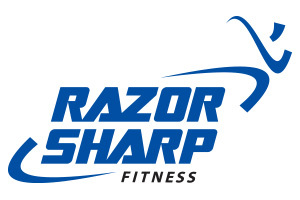 I really appreciate the classes at Razor Sharp because the instructors are so knowledgeable, they check for good form, they mix up the exercises to work muscles differently, they make adaptations for physical limitations so that everyone can participate, and they make exercising fun. I have tried a number of different classes and all of them have been very helpful. 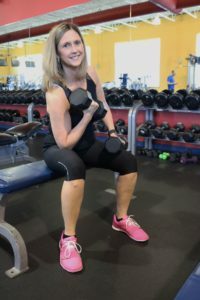 To improve my overall fitness, I also sought the assistance of a trainer, Janelle Cairo, and learned how each muscle area needs attention and how to plan my own workouts. 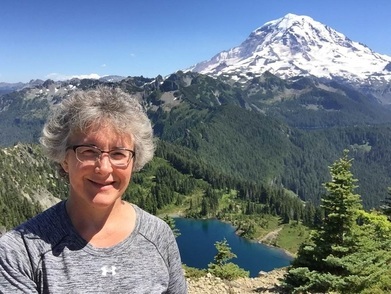 As a result, my fitness has improved and I am able to do more with my life, including hiking on Mount Rainier! Now, when I experience muscle pain, I have a much better idea of what to do to heal. Thank you Razor Sharp for helping me change the quality of my life! Following a shoulder injury, I had been out of the gym rehabilitating for more than a year. As you might guess, that time away takes its toll on the rest of the body. Needing to jump start my exercise program, I made the decision to sign up for this past spring’s Boot Camp. Boot Camp really helped me to get back on track in only two months. I have less stress, more energy and am able to manage my weight much better. A big “thank you” to all of the trainers for sharing their knowledge, passion for fitness and constant encouragement to help me achieve my goals. When my journey began in about May of 2014, my knees and shoulders were often in tremendous pain from years of sports. I was only 30 years old and I could barely get down to the floor and up again without help. Overwhelmed, and a little depressed, I didn’t have a clue where to start. I was afraid I’d injure myself more and tailspin into a truly unhealthy and unhappy life. After some encouragement from co-workers and family, I found Kate Thomas and Razor Sharp. Since then, I haven’t looked back. I put my trust in Kate to teach me the right exercises I could do so I wouldn’t injure myself more. I also found the professionals who led me to an important shoulder surgery that I badly needed. After that shoulder surgery in December of 2014, I was determined to get back to this journey and give 100% — I owed it to myself. I focused, one day at a time and trusted my mind and the support around me. 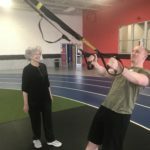 I eventually worked my way up to joining first Razor’s group exercise classes, and then last fall’s Lose it for the Holidays program (6 a.m. group training classes!) I thought it was nuts! After 10 weeks of the program, I made some great friendships and accomplished more than I ever thought I could. With the determination to work out every day, no matter how I feel, and some healthy eating (21-Day Fix, if you’re curious), I’m down almost 50 pounds and pretty pain free. I never thought I could get to this point again and I feel like a completely different person, inside and out. I’ve made a community of friends at Razor, many I feel will be life-long. My sincere thanks go to my family, to Kate and to the entire Razor Sharp team! I wouldn’t be where I am today without you all. This brings me back to the top quote and a final thought: trust in your wings! Trust the journey, take it a day at a time and with the Razor community to lend support, you will succeed! Amanda became a member of Razor Sharp in fall of 2015. As she tells it, her membership was “timid at first,” inspired by a corporate wellness challenge issued by her employer. 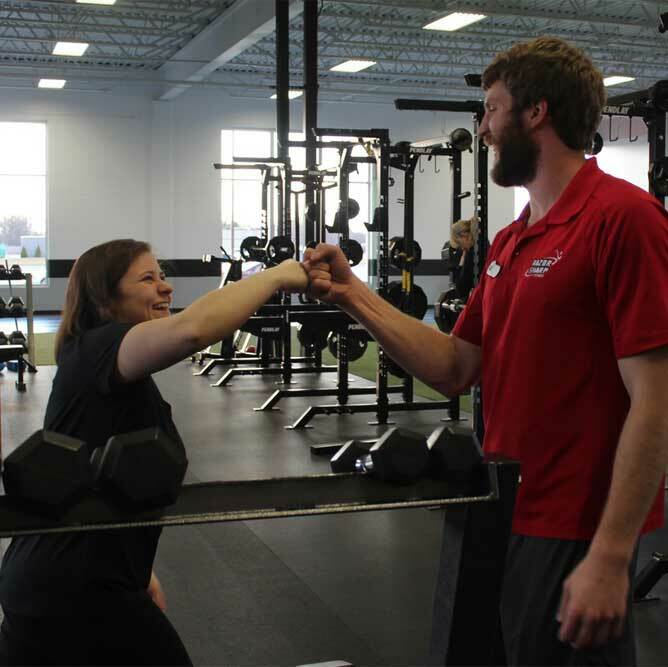 Amanda works downtown for ZMac Transportation Solutions, a company that understands just how difficult the weeks spanning Thanksgiving, Christmas and the New Year can be in terms of maintaining one’s health and fitness. Knowing this, the company put up a cash stake as an incentive for the person who lost the most weight during the 8-week challenge. Confronted by the dual realities of the challenge (with its potential financial reward!) and 70 “pregnancy pounds” that had now hung around for three years, Amanda took the plunge. And found that her enthusiasm for the workout challenge grew with each visit. “I knew I needed to start taking time for myself…to get back to the ‘me’ I was before,” Amanda explains. She just needed something to get her off the blocks. 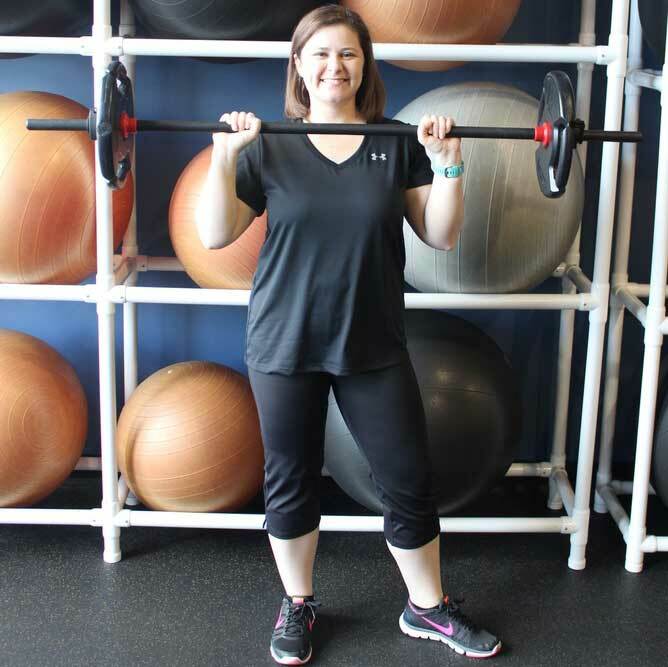 She started out working with Personal Trainer Kelli Anastasovski, to establish a realistic set of goals and a program to achieve them. That allowed her to get the workout habit started, and to eventually take full responsibility for working out on her own. 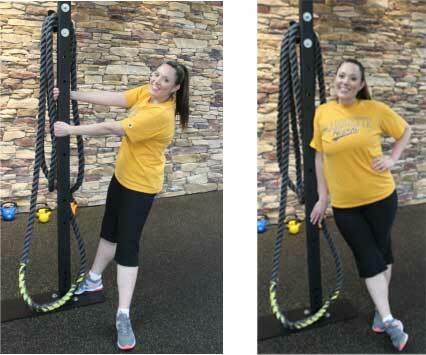 By mid-January and the end of the ZMac challenge, Amanda had lost 21 pounds – enough to win the prize! Realizing that goal made it relatively easy to continue, even during the cold and sloppy days of winter when it would have been so easy not to. But the other rewards – no longer being winded climbing a set of stairs, clothing that fit better, feeling more alert and energetic on days she worked out (powering through the mid-afternoon slump!) – were enough to overcome the urge to be sedentary. Since that time, Amanda has shed another 15 pounds and broken through the 10-minute/mile mark on the treadmill. 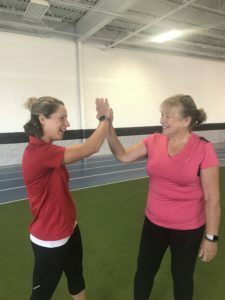 With each intermediate goal reached, it becomes more natural to set another goal to work towards: a 9-minute mile, a 5k run this fall, a 10k sometime after that…setting an example of health, fitness and self-care for her three-year-old daughter. 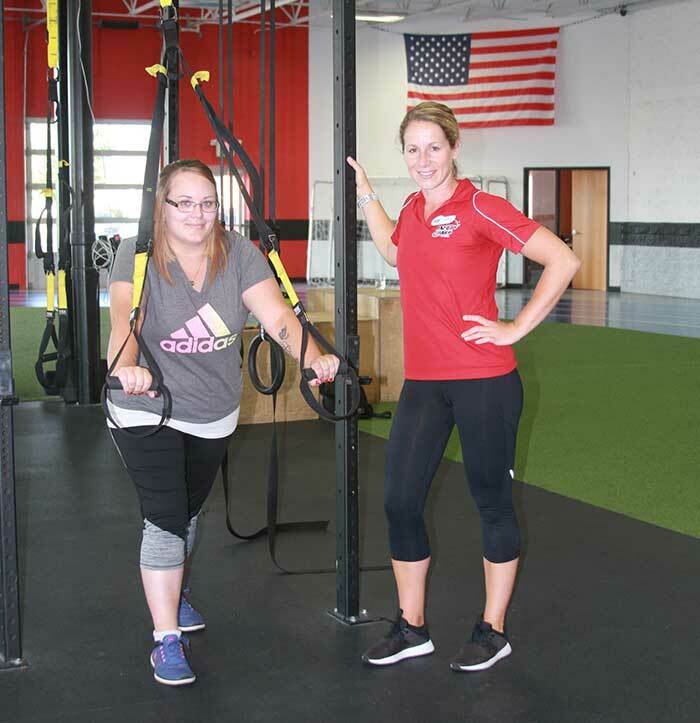 Amanda hopes her story will feel familiar to others – a high school athlete who became less active in college, tapering off almost entirely as “real life” set in. “By the time I had my daughter, I wasn’t exerting myself much, at all. I was somewhere between a lazy bum and a sad sack.” But the human body has a lot of innate resilience. Day by day and week by week, it’s possible to reverse many, if not all, of the negative effects of inactivity. It’s here that she hopes to be an example to others who may just be starting on their own fitness journeys. As for Amanda herself, saying “yes” to the challenge has meant rediscovering herself and gaining confidence in her ability to keep improving. “I’ve remembered that the best times of your life are when you’re getting sweaty,” she offers with a wink. And then she hit the treadmill! Wow, it’s been almost exactly one year since I joined Razor Sharp! When I started, I didn’t set any specific goals for myself, other than that I was going to make it a point to become a “regular.” It had been far too many years, and far too many extra pounds, since I exercised regularly. With the exception of a brief 3-month stint several years ago, I haven’t really done a thing for my own health since college, more than 15 years ago. 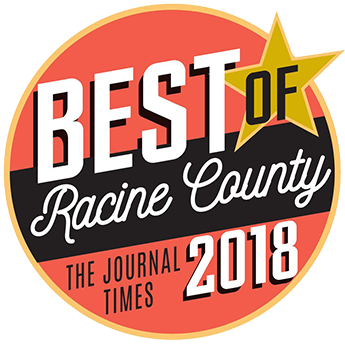 The irony is that nine years of medical training to become a surgeon, my young and growing family, and establishing my practice here in Racine kept me focused on the health and well-being of others. Meanwhile, I believed I didn’t have the time or energy left to address my own health and fitness. I kept telling myself that “someday” I’d be able to find the time to start exercising again. “Someday” came last year when the downtown Razor Sharp club opened. Seeing how conveniently located it was between my house and the hospital, I thought I could get creative with my time management to hit the gym on the way to or from work. I started off doing the same basic type of exercises I did when I was younger, but I made it a point to end each session with some cardiovascular exercise on the elliptical machine. The more I went, the better I felt. The better I felt, the more I wanted to go to the gym. As my schedule seemed to constantly be changing, I discovered I could take advantage of breaks in my workday to head over to the gym for an hour or so and get a quick workout in. While I found it difficult to have a specific time to exercise, I was able to make it to the gym most days of the week. 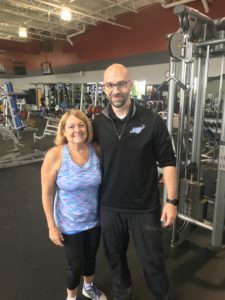 Several months into my workout regimen, I took advantage of my 1-on-1 session with Personal Trainer Dan Buhler to learn some newer exercises, and I started changing my routine to a more circuit training-style of exercise. One year later and 80 pounds lighter, I feel great, and am thankful for all the encouragement the Razor Sharp staff has given along the way. You can try out a personal training session for free! Fill out the form below to learn how and get started today.